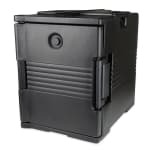 Keep your food secure and at safe temperatures during transport with this Cambro UPC400110 Ultra Camcarrier front loader pan carrier with a 60 quart capacity. Constructed with a one-piece polyethylene shell, this front-loading food carrier is fully insulated to maintain safe temperatures. Its air-tight gasket locks in temperatures so that your foods stay fresher and hotter for longer. This pan carrier holds half-, third-, and full-size pans and is stackable for storing and moving a large amount of food at once. 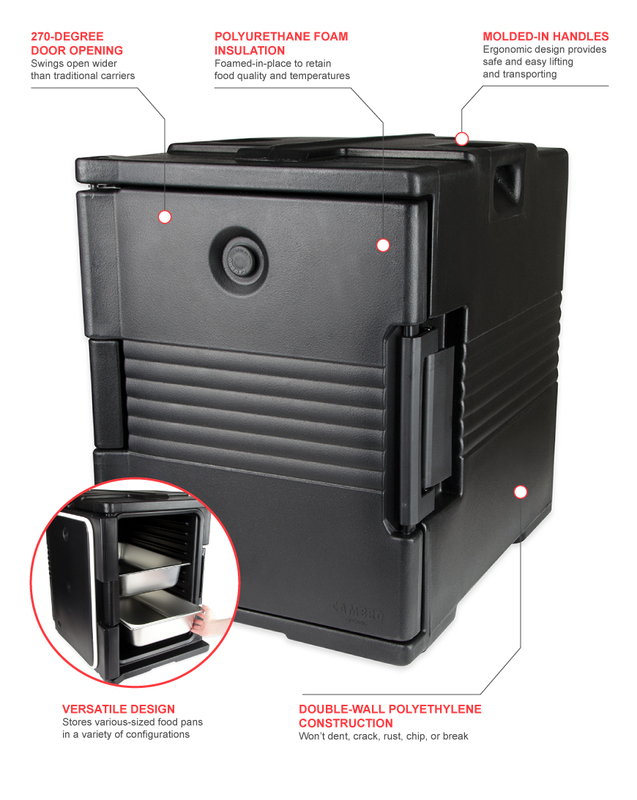 The molded-in handles, nylon latch, and built-in seal provide the best in food carrier security so that you never have to worry about accidents or spills. Its black finish looks professional and will easily hide scratches and stains. The door on the Cambro UPC400110 Ultra Camcarrier front loader pan carrier opens 270 degrees the side so loading and unloading the carrier is simple. Holds 12 trays measuring 12 in. x 20 in. Holds 12 trays measuring 13 in. x 18 in.